Rebecca Kiss/Assistant Photo Editor Rigatoni a la vodka. Known for its signature dish — rigatoni a la vodka — and eclectic decor that seems too cool for Downtown Binghamton, the Lost Dog Cafe is an interesting place to say the least. Named in honor of a spunky little chihuahua named Clarese, the Lost Dog Cafe is the place to be if you fancy great food, wonderful service and a relaxed atmosphere. For Restaurant Week, the Lost Dog Cafe is offering both lunch and dinner menus at the fixed prices of $12 and $20, respectively. My photographer Rebecca and I went for the dinner special and were presented with an array of appetizer options to start our meal. Rebecca chose to go with the avocado toast, which was the perfect size for an appetizer and came with a generous amount of avocado. It was topped with pistachio, which added a new level of texture to the dish. I chose to forgo an appetizer in favor of wine — the house chardonnay to be exact. If wine isn’t your thing, but beer is, the Restaurant Week menu also offers the Lost Dog Pale Ale as another substitute for an appetizer. Other appetizer offerings included spinach and artichoke dip with tortilla chips, the Dog House salad and a soup of the day. If you’re under 21, I recommend the dip; it’s warm, creamy and delicious and pairs perfectly with the crisp and salty tortilla chips, though it is hard to taste any spinach or artichoke flavor. For the main course, we both, without much thought, ordered the rigatoni a la vodka because we’ve been to the Lost Dog before and the dish left a lasting impression on us. It was, of course, delicious in every way. From the perfectly cooked pasta to the vodka sauce that puts all others I’ve tasted to shame, I could find no fault with this dish. 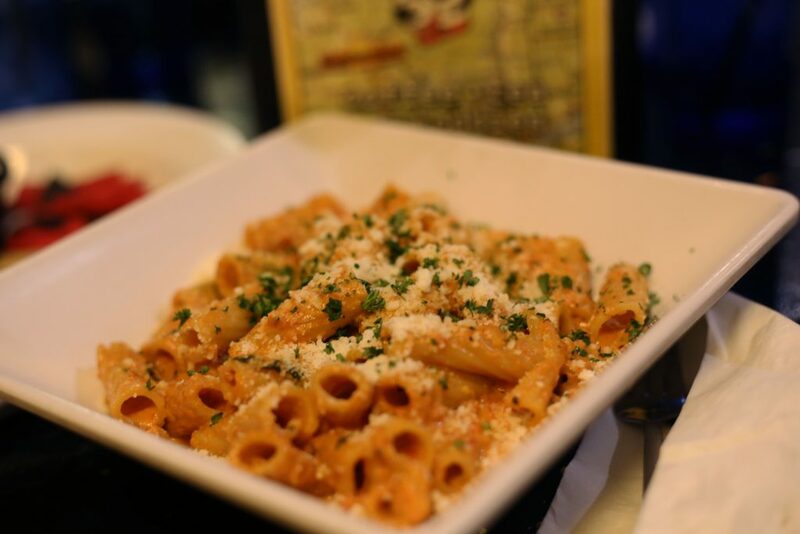 For something that sounds quite simple, the rigatoni is anything but. The chefs have managed to create layers of flavor within the sauce that elevate the dish to a higher level than similar ones. If you’ve never experienced it for yourself, I highly recommend trying it the next time you’re Downtown. Seeing as how the menu is adapted for Restaurant Week, I expected the portions to be smaller, but this was not the case. The portions were still fairly large, and I wasn’t able to finish mine because I knew a dessert was coming. If you don’t fancy pasta, no worries. The menu also features chicken or tofu curry, churrasco steak and potatoes and “Fancy Mac” — a macaroni and cheese with mushrooms, truffle oil and balsamic glaze. When the time came to order dessert, Rebecca chose the springtime carrot cake with walnuts and cream cheese frosting, while I decided to go for the flourless chocolate torte. Rebecca’s cake came out looking like a hearty homemade dish, so when my dessert came out and was a significantly smaller slice, I was a bit disappointed — until I took a bite. Once I tasted it I understood why it was so small: It was soft, dense and the richest chocolate confection I’ve ever tasted. If you aren’t a fan of rich desserts, I don’t recommend this dish. There is also an upside-down vanilla rainbow cake on the menu. Besides having an array of foods inspired by different regions of the world, the Lost Dog Cafe also has a friendly and attentive staff — shoutout to our waitress Michelle — and an atmosphere that immediately puts you at ease and allows you to thoroughly enjoy your time there. There are a variety of gluten-free, vegetarian and vegan options catering to the needs of anyone who may walk through its door. If the normal price of having dinner at the Lost Dog has deterred you from going before, now is the time to go.